Judging by the daily news headlines, most gods may have forsaken most of humanity, but the gods of Swedish death metal have not forsaken Gods Forsaken. To the contrary, they seem to have possessed this band and to live through them in riotous joy. Their new album, Smells of Death, already seems poised to take its place in the pantheon. 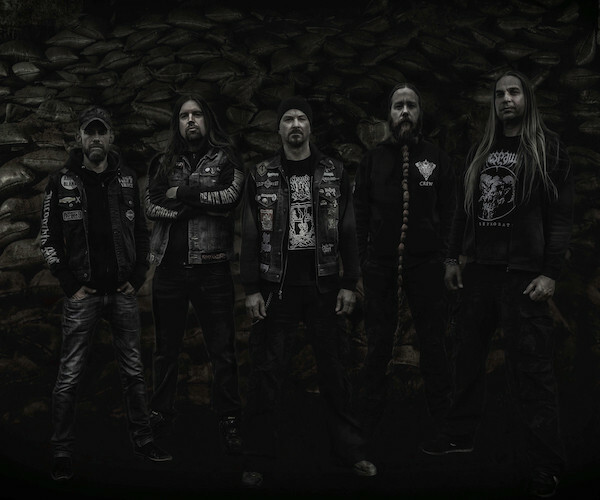 For those who don’t already know, Gods Forsaken began with a veteran lineup consisting of guitarist/bassist Anders Biazzi (Just Before Dawn), vocalist Jonny Pettersson (Wombbath, Henry Kane, Ashcloud, etc. ), and drummer Brynjar Helgetun (Just Before Dawn, Crypticus, Johansson & Speckman, Megascavenger, etc., etc.). The first album included some notable guest appearances, including solos by Gustav Myrin (ex-Blood Mortized). On this new album Mr. Myrin is again on board, this time as lead guitarist, and Alwin Bassphyx (Asphyx) joins in as rhythm guitarist. In February the band premiered “From The Inside They Came“, and it lit up my head like a torch. Now we’ve got the distinct pleasure to bring you another song off the album, this one called “They Crawl“. The opening of the track will grab you by the throat immediately, thanks to explosive drum and bass detonations, and the roiling, toxic tone of a swarming riff. After properly hitting you so hard, the band segue into an assault of battering drums, hard-punching bass, and ravaging guitar, combined with raw, howling and screaming vocal horrors. The music is hugely head-bangable, and in its atmosphere it blends a feeling of dismal desolation with the fires of a savage conflagration. But the really enormous headbang trigger is yet to come. Following an eerie, wraithlike bridge, the band deliver a gigantic, pile-driving riff and a skull-cracking bass-and-drum rhythm that will leave sore necks far and wide. But Gods Forsaken still haven’t finished attempting to dismantle your skeletal structure, because they then deliver a warlike attack of heavy artillery from the rhythm section and ferocious, swarming chords, before charging ahead in a mauling gallop once again. This new track makes a great companion to “From The Inside They Came“, which is a massive, slaughtering attack in its own right — massive in the tone of those delicious chainsawing riffs, massive in the thundering destructive power of the drumming and the heavyweight thrum of the bass, and massive in its power to make your head pump like a piston. You can check it out below as well. Smells of Death features cover artwork by Patrik Tegnander (Chainsaw Design). It was produced by Jonny Pettersson, Anders Biazzi, and Alwin Zuur, and it was mixed and mastered in Studio Unbound (Revolting, Heads for the Dead, Just Before Dawn) by Jonny Pettersson.